Overpronation and oversupination of the foot are terms used to describe how your foot moves when you walk or run. if you overpronate or oversupinate then you may be more susceptible to a number of sports injuries. Overpronation is often recognised as a flattening or rolling in of the foot but it is not quite as simple as that. The timing of when the foot rolls in is also important. Pronation occurs when the foot naturally rolls inwards as weight is transferred from the heel to the forefoot. A certain amount of this is natural but in many people the foot rolls in too much or overpronates. When standing, pronation occurs as the foot rolls inwards and the arch of the foot flattens, hence the term often used to describe someone who overpronates as having ‘flat feet’. Pronation is a normal and helps provide shock absorption at the foot. The opposite movement to pronation is supination. Firstly, look at your feet when standing. Have you got a clear arch on the inside of the foot? If there is not an arch and the innermost part of the sole touches the floor, then your feet are overpronated. Secondly, look at your running shoes. If they are worn on the inside of the sole in particular, then pronation may be a problem for you. Thirdly, try the wet foot test. Wet your feet and walk along a section of paving and look at the footprints you leave. A normal foot will leave a print of the heel, connected to the forefoot by a strip approximately half the width of the foot on the outside of the sole. If your feet are pronated there may be little distinction between the rear and forefoot, shown opposite. 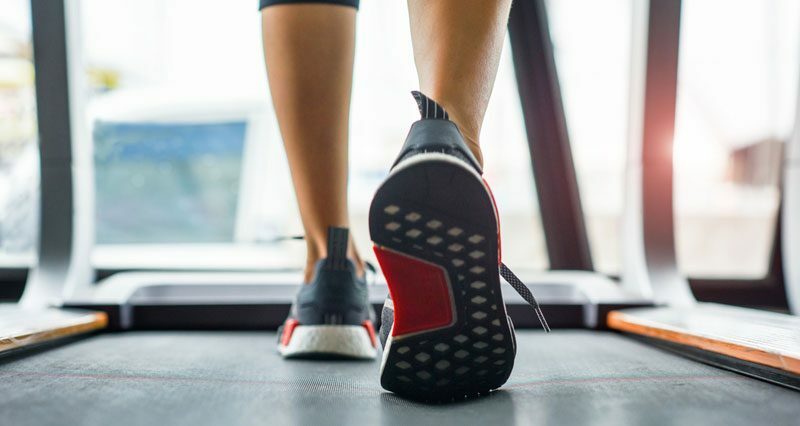 The best way to determine if you overpronate is to visit a podiatrist or similar who can do a full gait analysis on a treadmill or using force plates measuring exactly the forces and angles of the foot whilst running. It is not only the amount of overpronation which is important but the timing of it during the gait cycle as well that needs to be assessed. How does overpronation cause Injury? Overpronation usually causes overuse type injuries, occurring most frequently in runners. When a neutral foot pronates during walking or running, the lower leg, knee, and thigh all rotate internally (medially). When an athlete with an overpronates this rotation inwards movement is exaggerated. This, in turn, increases the stresses on the muscles, tendons and, ligaments of the foot, lower leg including shin and knee as the limb rotates in too far. When someone overpronates, the foot rolls in or flattens. This causes the lower leg to turn inwards, which puts the knee and hip out of alignment and can cause the back to be rotated as well. Get a gait analysis of your running style, this will highlight if you overpronate, oversupinate or have a neutral gait. Most podiatrists, physios and sports therapists will offer this service, as do some specialist sports shops. If overpronation is a problem that a shoe with extra medial support is preferable. Many running shoes have a harder material on the inside of the midsole (the thick hard foam part of the running shoe). This means the inside of the shoe will be compressed less under load and support the inside of the foot preventing it from rolling in or flattening. 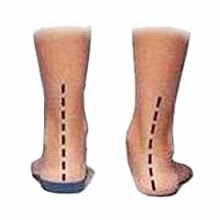 For people with considerable overpronation, another option is to have an orthotic device fitted. Orthotic insoles come at many types and prices. Some are pre-molded and can be bought off the shelf. These are ok for the majority of problem feet. However, some cases may require specially casted orthotics from a relevant sports injury therapist or podiatrist. Supination is a movement at the foot which is a necessary movement for walking and running among other activities. However, in some cases, over-supination can become a problem which leads to injuries. Supination is the natural movement of the foot as it rolls out during the gait cycle. In particular, it is the movement of the subtalar joint (between the talus and calcaneus) into inversion, plantar flexion, and adduction. Inversion is where the sole of the foot is turned inwards, plantar flexion is where the foot and toes point downwards and adduction of the ankle involves the toes pointing across the body. Combine all three movements and you have supination. The opposite movement to supination is pronation, this is also a normal part of the gait cycle and when excessive is termed overpronation. Oversupination usually causes over-use type injuries, occurring most frequently in runners. A foot which oversupinates, underpronates. Pronation allows the foot to absorb shock and mould to the surface of the ground. Therefore in oversupinated feet, shock absorption is reduced. The stresses normally absorbed by the foot are then passed up the lower limb. Oversupination also causes an increased external (lateral) rotation force to be placed on the shin, knee, and thigh which places additional stress on the muscles, tendons, and ligaments of the lower limb. How can I tell if I oversupinate? Gait analysis where your running style is assessed on a treadmill or force plate by a suitably qualified professional will highlight if you overpronate, oversupinate or have a neutral gait. Most podiatrists, physio’s and sports therapists will offer this service, as do some specialist sports shops. Running shoes – For over supination you need a highly cushioned and flexible running shoe to make up for the lack of shock absorption at your foot. Visit a specialist running shoe shop where they can look at your feet and running style and advise on shoes for supination. Insoles – For people with considerable over supination, another option is to have an orthotic device or orthotic insole fitted. Orthotics and insoles come at many types and prices. Some are pre-molded and can be bought off the shelf. These are ok for the majority of problem feet. However, some cases may require specially casted orthotics from a relevant sports injury therapist or podiatrist. You wouldn’t build a house without getting the foundations right so why do it with your body.